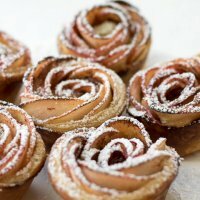 Hi Everyone, I am so glad to share this Apple Rose Puff Pastry Recipe today, aren’t they so pleasing and pretty? That’s how I felt when I made them. I had an abundance of apples from going apple picking early this apple season and this was one of the recipes that I had in mind to make. It is so satisfying to make theses and delicious to eat them when they are done. 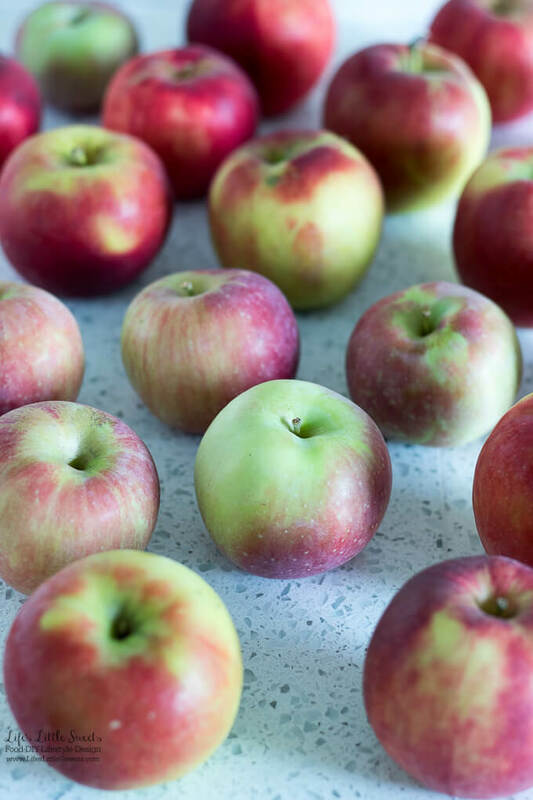 In New Jersey, apple season is from September 1st to October 25th (as early as July 15th and as late as October 31st). I made sure to include step-by-step photos in the recipe card for this recipe below to help illustrate each step. 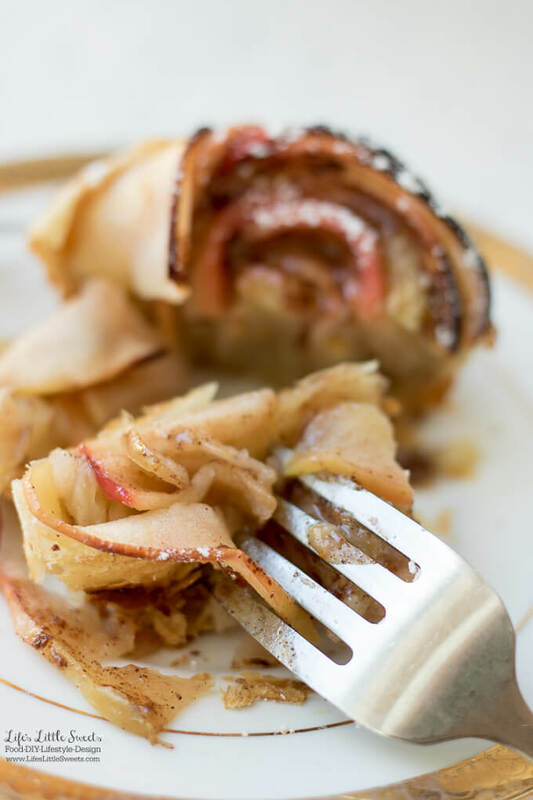 I know you will love this Apple Rose Puff Pastry Recipe recipe! 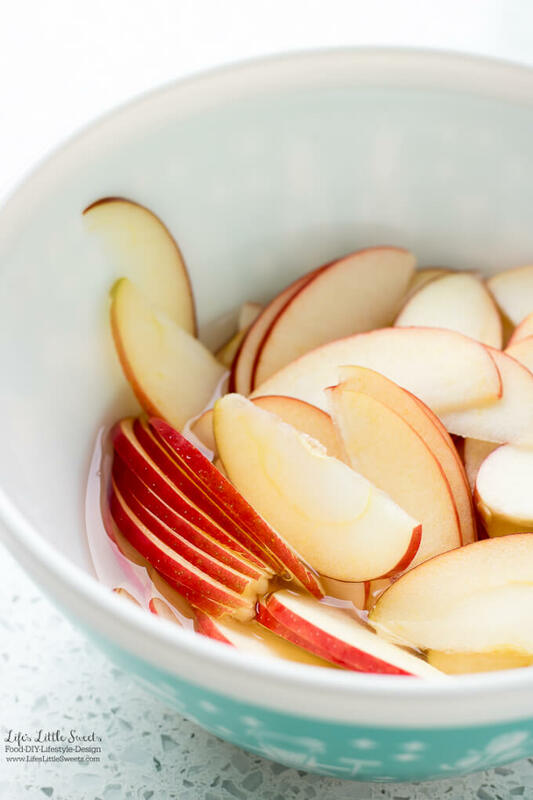 In a medium-large mixing bowl, put apple slices in with water (covering the apples) and 2 tablespoons fresh-squeezed lemon juice. 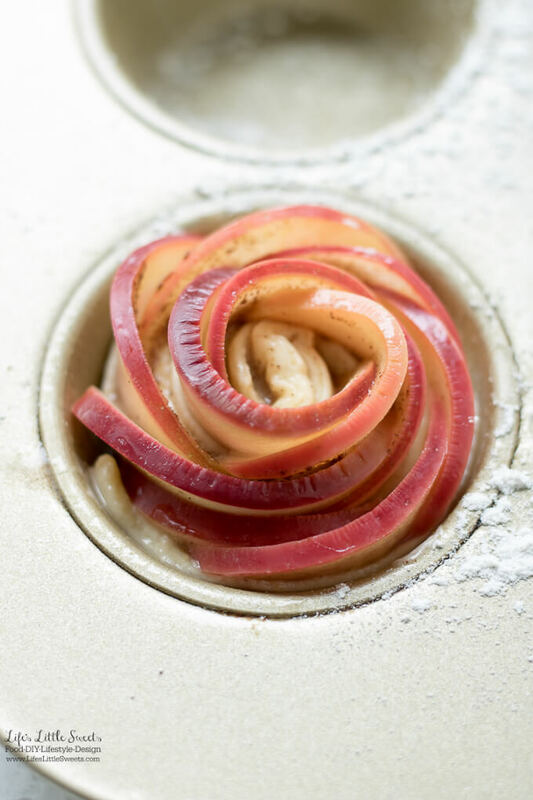 This step keeps the apples from turning brown. Microwave the apples for 3 minutes - this helps the apples soften, so they do not break when you roll them. Alternately, you can simmer them on the stove top for a few minutes. 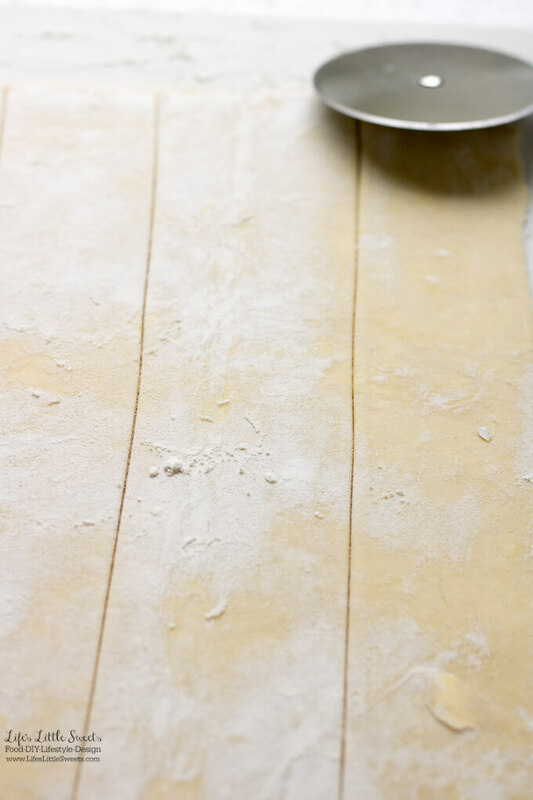 On a floured surface, using a rolling pin, roll out the puff pastry dough, so that it's 12 x 9 inches (30 x 22 cm). Using a knife or pizza cutter, cut the dough into 6 strips, about 2 x 9 inches each ( 5 x 22 cm). In a small bowl, mix 3 tablespoons of apricot jam with two tablespoons water. Microwave for 1 minute. 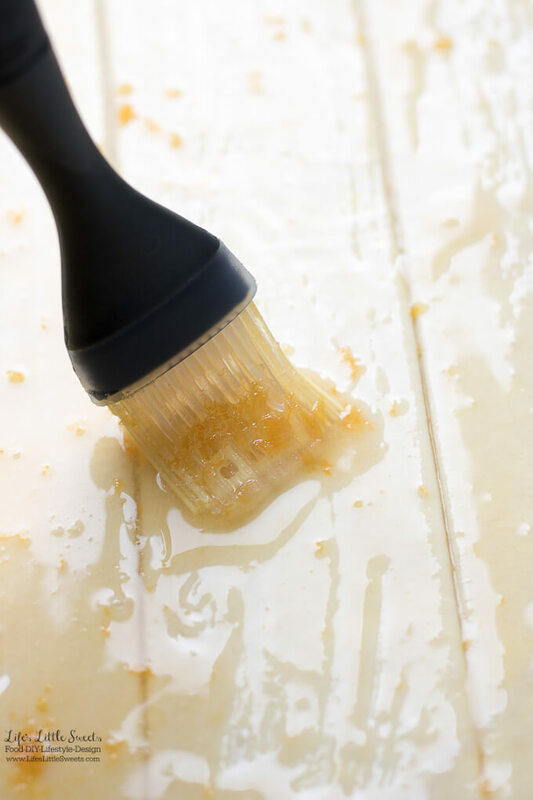 Using a pastry brush, brush the surface of the dough with the apricot-water mixture. Grease a 6 muffin, muffin tin (if it's silicone, there's no need to grease it), set aside. Using a colander, drain the apples from the lemon-water mixture. Place the apple slices, overlapping each other on each puff pastry strip so that the skin side is up. 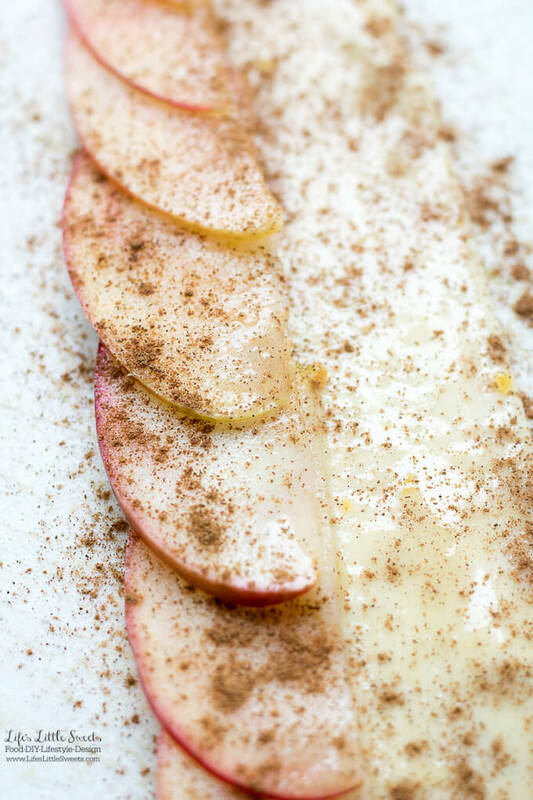 Sprinkle the open apple slice pastry strip with cinnamon. 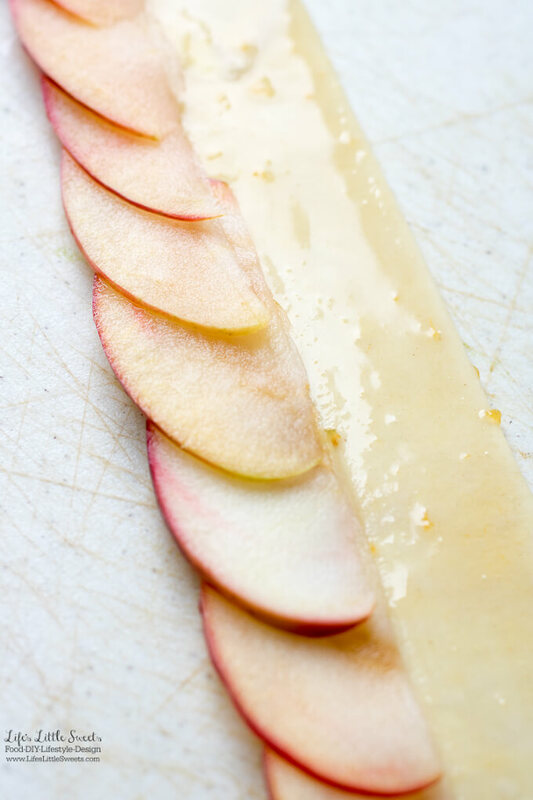 Fold over the puff pastry strip to cover the bottom edge of the apples. 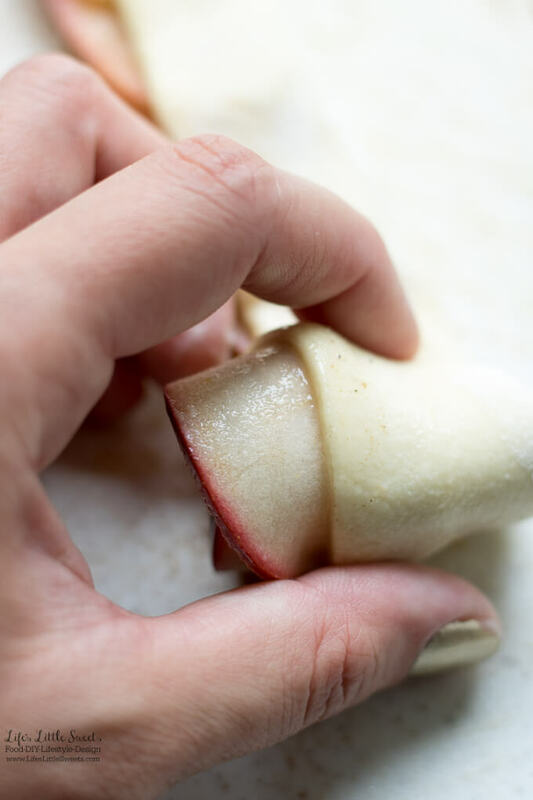 Starting at one end, roll the apple slice filed dough strip, making a circular roll. 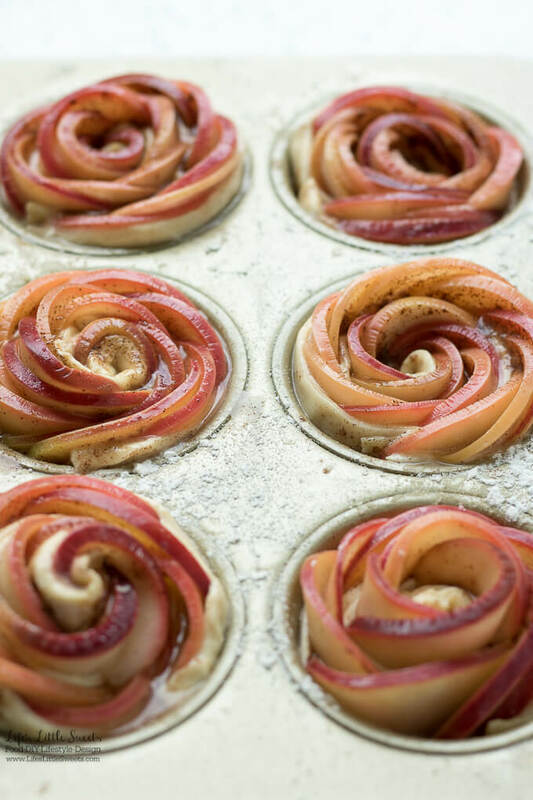 Place the completed apple rose in the prepared muffin tin. Repeat 5 more times. Bake in preheated oven for 40-45 minutes or until fully cooked. 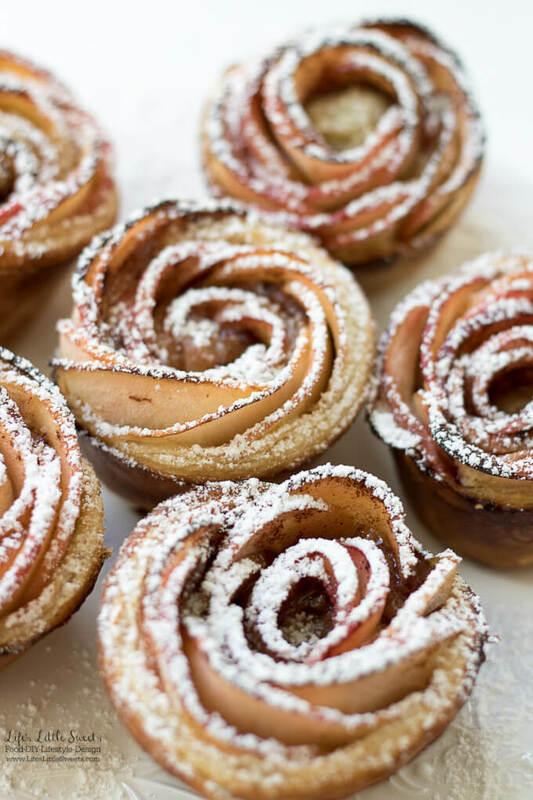 Use a foil tent over the apple roses to prevent the tops from burning, in the last 10-15 minutes, if needed. 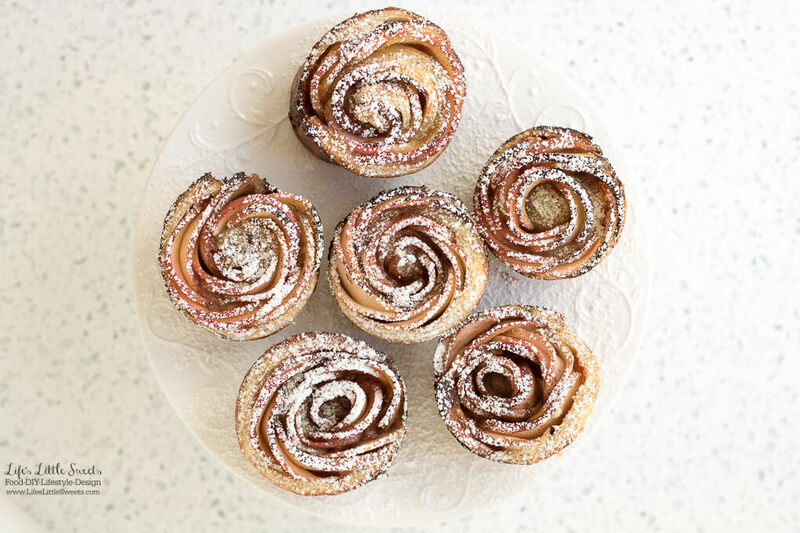 When the apple roses are done baking, allow to cool and then sprinkle with confectioner's sugar before serving, enjoy! 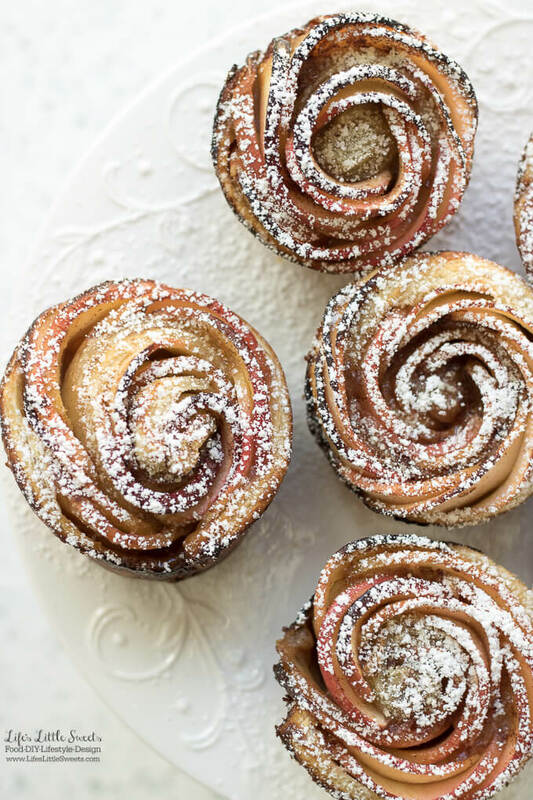 These apple roses taste best when served the same day after baking and can be stored in an air-tight container for up to 2 days at room temperature or in the refrigerator for up to 3 days. 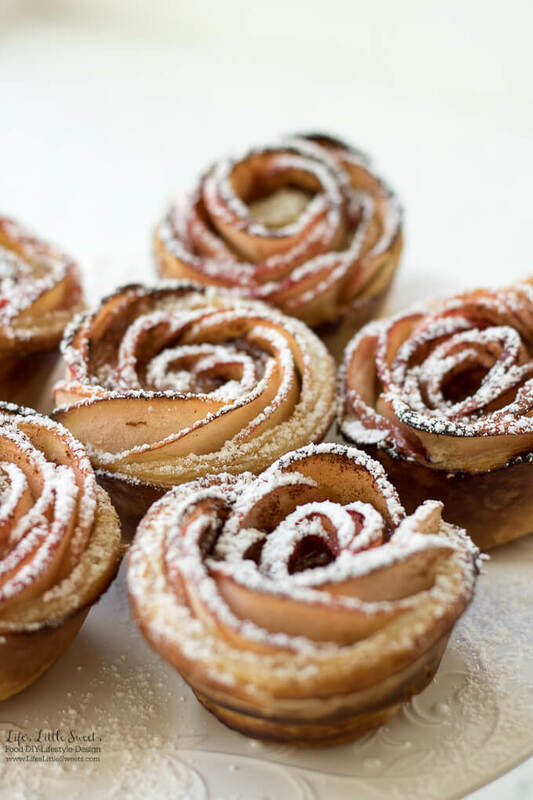 This Apple Rose Puff Pastry Recipe is inspired by Apple Roses.